Miami Gardens Police K9 Max lost his life following an accident while searching a building on September 12. K9 Ofc. Chris Bezio was deploying Max through a window on a burglary call when broken glass fell on the dog. 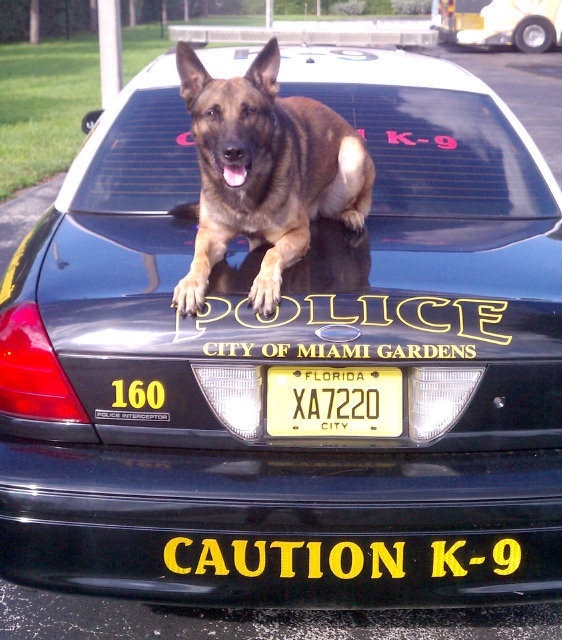 K9 Max was rushed to the Hollywood Animal Hospital, but he died from complications of his injury. K9 Max was a five year old German Shepherd Dog and had been partnered with Bezio for four years. Max was a dual purpose K9, trained for patrol and as an explosives detector dog. A funeral was held yesterday for the fallen dog. Over a hundred officers and K9 teams were in attendance. According to the Officer Down Memorial Page (ODMP), a total of 15 police service dogs have died in the line of duty in the U.S. thus far in 2013. Police K9’s perform a unique function that saves lives. This is a very sad incident. Handlers and K9’s face danger every shift. I am honored to have worked with them. This entry was posted in K9 and tagged Police K9. Bookmark the permalink.